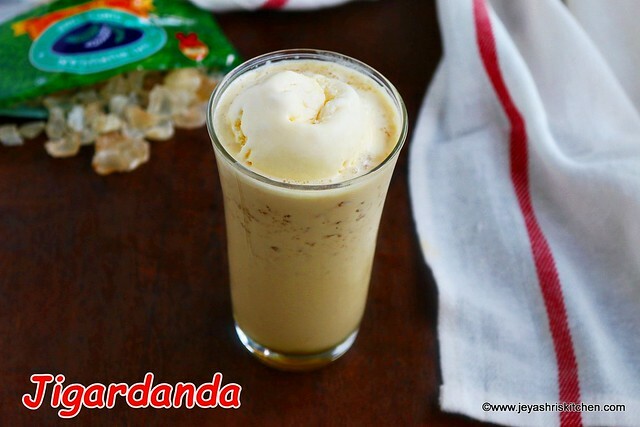 Jigarthanda recipe, learn how to make jigarthanda with video. Jigarthanda recipe, a popular drink in Madurai, made using milk, badam pisin and nannari syrup. Being born and brought up in Madurai, i have tasted this jil jil jigarthanda in a famous shop in Vilkuthoon area. After started living in Chennai, when Madurai Murugan idli kadai was opened in Chennai, tasted there few times. But after moving to Singapore, never had a chance to taste the authentic delicious Madurai famous Jil jil jigarthanda. Though we get in Murugan idli kadai Singapore, the taste still can not match the original one. Even the recipe i have given here is not authentic, but it tasted almost closer to the one we get in Madurai. 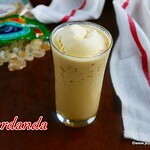 For a long time i wanted to post this recipe of jigarthanda but i never happened to find Badam pisin here. Finally saw that in Sri Murugan stores Singapore. We are getting Badam pisin in Sri Murugan stores Singapore. Sri Murugan stores has outlets across the Island. They also do door delivery of grocery and fresh vegetables. You can download Sri Murugan android and iOs app to make your order. I buy my Monthly grocery in Sri Murugan stores and i am quite satisfied with their products and service. Jigarthanda recipe, a popular drink in Madurai, made using milk, badam pisin and nannari syrup. Soak the badam pisin in water for 4-5 hours or overnight. It will nicely fluff up. Actually this quantity will serve for 2 glasses of jigarthanda. Rest all ingredients are for single serving only. So adjust accordingly. In a heavy bottomed pan add the sugar. We are adding sugar now to caramelise it. So that we get a nice color of the jigarthanda. I felt 1 tblsp is bit more and you can reduce it too. Or completely skip the sugar and add unsweetened milk khoa to the milk. This will be too heavy so i didn't use khoa. Caramelise the sugar, just heat the pan and melt the sugar. Do not add any water. When the sugar turns into a golden honey colour, switch off the flame. Add the milk to this. We are switching off the flame as the milk may splash or splutter. Turn on the stove now. You may feel the solidified sugar at the bottom of the pan. Do not worry, it will dissolve with the milk once it starts boiling. Keep the flame to medium low. Boil till the milk reduces to 3/4 th of the quantity. Switch off the flame and allow this to cool completely. Now all the ingredients are ready for jigarthanda. In a glass add 2 tblsp of the fluffed badam pisin. Add the nannari syrup. We get in most of the Indian shops. Sri Murugan stores, Singapore also sells Nanari syrup. Finally top with a scoop of vanilla ice cream. Madurai Speical jil jil Jigarthanda is ready. If you don't get badam pisin in your place you can use Edible gondh(the Rajasthani one). Soak that for 2 hours and proceed with the recipe. Even you can use agar agar also. If you are not particular about the colour, just proceed with the reduced chilled milk, avoid adding sugar. 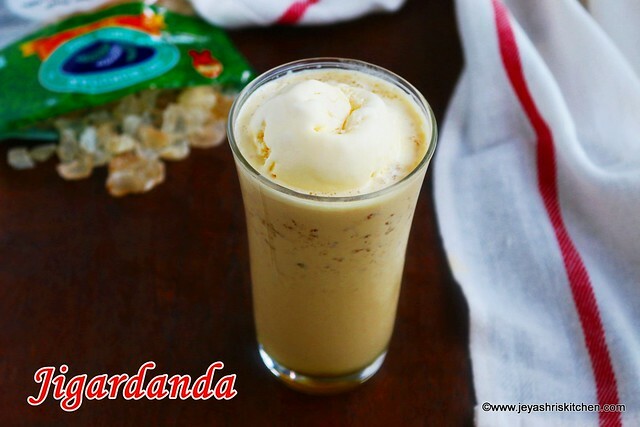 Keep all the ingredients chilled and serve this Madurai speical Jigarthanda for the guests as dessert. That's the very nice post you have shared with us. I really liked it.it is very simple recipe which i can try.Freshers in cooking can all also do this recipe within time. I feel hungry. i love to try cooking recipes.Please keep sharing more and more cooking tips. S banana also added an? ?